By midsummer, this tidy perennial bears a cloud of white to light blue flowers that float above shiny, mint-scented leaves. A great front-of-the-border plant, calamint is deer resistant and drought tolerant. “It blooms for an incredibly long time and is a favorite of many pollinators. No garden should be without it,” said Jill Selinger, manager of continuing education. 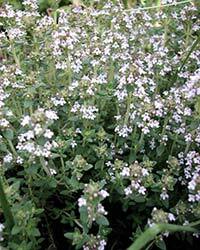 Lesser calamint may be found in the Josephine P. & John J. Louis Foundation Green Roof Garden North.